‘IN RUHLEBEN CAMP’ Xmas number pages 24 – 25 1915 price threepence. A map of Ruhleben camp and its facilities, designed by G.Jones. IN RUHLEBEN CAMP magazine issue No 2 Sunday June 27th 1915 page 48. 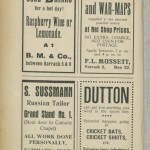 A full page of advertisements for various small businesses selling cool drinks, sports equipment, books and a tailoring service. In RUHLEBEN CAMP MAGAZINE August Bank Holiday 1915. Issue No4 cost ‘thrippence’ page 37. 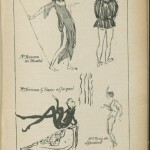 A page of drawings by Molyneaux depicting the elitism of a club in the camp. Some four months after the First World War began the first people taken into captivity by the Germans were ‘alien citizens’ – those that were living, working or studying in Germany. These people were of many professions and from different echelons of society; Baronets, Earls, artists, lecturers, engineers, and young men sent to Germany to learn the language, commercial travellers, waiters, fishermen and merchant seamen removed from ships in the docks, but they had one thing in common: all were destined to be interned in Ruhleben an improvised internment camp near Berlin. The majority were British subjects. In all, approximately 4,000 men between the ages of 17 and 45 were rounded up and sent to the camp. 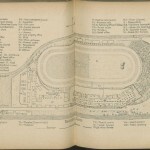 Ruhleben was a horse racetrack located on the outskirts of Berlin, which the German military had designated as an internment camp and over the course of the war it became a temporary ‘home’ to more than 5,500 civilians. Initially, the living conditions were very poor, horse stalls were converted into barracks and housing for the men, overcrowding and unsanitary conditions along with poor food made conditions untenable. However despite incarceration in a very difficult environment, the British spirit shone through and the internees created in the words of one of them ‘a bit of England, a small British colony planted in the heart of the enemy’s country.’ The camp was turned into a habitable ‘town’ with all the necessities catered for by the industriousness of the internees. Shops were opened, and barbers, carpenters and tailors provided for – anything and everything to make money within the camp. The German authorities adhered to the Geneva Convention and the internees were allowed to administer to their own affairs. Gradually a mini society evolved in the camp. 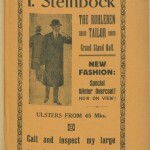 The detainees organised their own Police force, magazine, library and postal service. Arts and culture developed: musical theatre, plays, and comedies. Education evolved as schools were set up with lectures on a myriad of subjects. Sport played a major role in the life of the internees, some of whom were professional sportsmen. Leagues were set up and competitions organised. Great things were accomplished in the camp and as well as starting numerous businesses, a print shop was established and daily newspapers and periodicals such as ‘ In Ruhleben Camp’ and ‘Ruhleben Camp’ magazine were published. 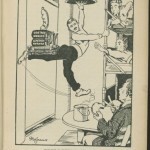 There are many enjoyable articles, reviews, drawings and cartoons in these publications and I have chosen a few of my favourites to give a very small introduction to a wider audience of the strength of character and tenacity of the British internees as they maintained a little bit of Great Britain under extreme circumstances while going about their daily lives. 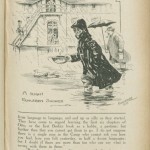 Further extracts from the Ruhleben Camp magazines can be seen on our Serving Soldier website. This entry was posted in Liddell Hart Centre for Military Archives, Military history and tagged adverisement, archives, caracature, internment camps, magazine, ruhleben, World War One by Lianne Smith. Bookmark the permalink.